When you go to see Grandma, a feminist comedy out Aug. 21, you'll immediately spot some familiar faces: Lily Tomlin, of course; Sam Elliott; and Laverne Cox, among others. But if find yourself watching the film and not recognizing who plays the mom in Grandma , despite thinking, "I've definitely seen her somewhere," you're not alone. But, now that you've asked the question, you should know the answer: it's Marcia Gay Harden — and from now on, you should remember her name. Harden is an Oscar and Tony-winning actress, and yet, many people don't know who she is. It's not that you wouldn't recognize if you saw her, but she's difficult to place, having been in everything from Lifetime movies to Clint Eastwood's Mystic River. Harden has often found a home in roles that land somewhere on the dramatic-comedic spectrum. Recently, she played the assertive, funny, lawyer Rebecca Halliday on HBO's The Newsroom; starred in the short-lived sitcom, Trophy Wife; and played a supporting role in the JFK assassination film Parkland, alongside Zac Efron. 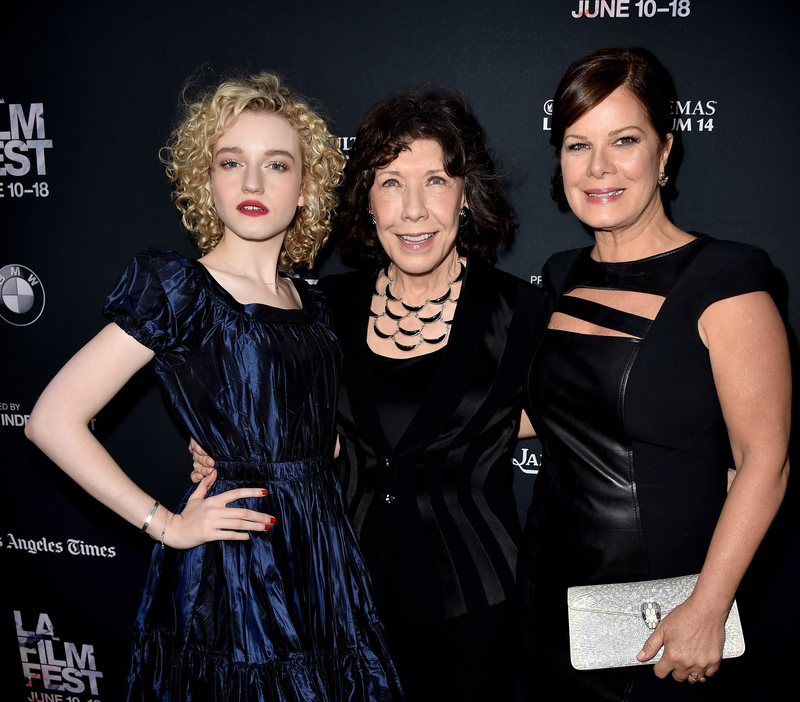 Now, in Grandma, Harden plays Judy, the daughter of Lily Tomlin's Elle and mother of Julia Garner's Sage. The role is supporting, and not without its quirks — she plays a tightly wound businesswoman who works from a treadmill desk, completely oblivious to her daughter's unexpected pregnancy and desire for an abortion (the conflict at the center of Grandma). Harden's career has blossomed on stage and screen, as evidenced by what I can only assume is a tasteful trophy case. Over Harden's 20-plus year career, she has amassed a large number of awards and nominations, including two Oscar nods — she won for her role in Pollack (2001) — two Emmy nominations, and many critics' circle awards, not to mention a Tony Award nomination and a Drama Desk Award. But Harden isn't just a highly acclaimed and respected actress, but also an extremely prolific one. Looking at Harden's career, it's ridiculous that she hasn't inspired a Six Degrees from Marcia Gay Harden game, a la Kevin Bacon. (Fun fact: Harden is credited on IMDB as being a dancer in Bacon's Footloose.) She worked with Goldie Hawn, Bette Midler, Diane Keaton, Maggie Smith and Stockard Channing in The First Wives Club (1996); Robin Williams in Flubber (1997); Kirsten Dunst, Julia Stiles and Maggie Gyllenhaal in Mona Lisa Smile; and the list goes on. "A hundred years ago, I had the good blessing to meet Robin Williams, and all memories of that movie [Flubber] are about flying up and down on wires with Robin while getting into a flying car. And all he did was make the crew laugh. It was the loudest set I've ever been on. He was the kindest person," Harden told The AV Club of working on Flubber. Grandma is heading to theaters on Aug. 21, but Harden isn't limiting herself to one kind of role. In the fall, the How To Get Away With Murder guest star will star in CBS' medical drama, Code Black. Oh, and she also plays Christian Grey's onscreen mama in Fifty Shades of Grey, which means she pretty much birthed one of the hottest men ever to grace a movie screen. If you don't worship Marcia Gay Harden at this point, I don't think I can do anything for you.